Cut potatoes in half and place into pot of salted water to part boil. 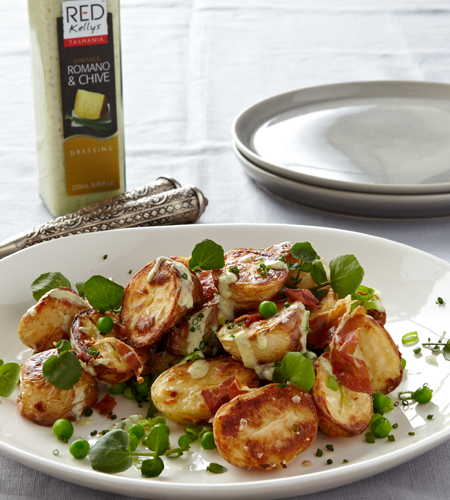 Remove potatoes from water and place onto oven tray drizzled with olive oil – Place into pre-heated 180°C oven for 15 mins or until golden brown. Place Peas into pot of boiling water for 3 minutes and drain. Cut Pancetta into small pieces and place onto crease proof paper into pre-heated oven, occasionally turning until crispy. 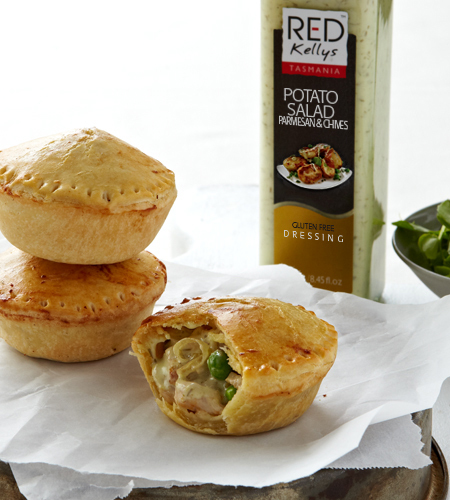 Combine all ingredients onto a serving plate with a generous amount of Red Kellys PArmesan & Chive dressing.